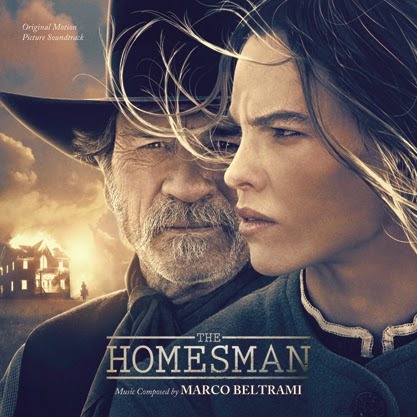 (November 10, 2014– Los Angeles, CA) – Varèse Sarabande Records will release THE HOMESMAN – Original Motion Picture Soundtrack digitally on November 17 and on CD December 9, 2014. The soundtrack features the original score composed by Marco Beltrami (SNOWPIERCER, WORLD WAR Z). Award-winning composer Marco Beltrami established an early reputation as a genre innovator with non-traditional horror scores for the SCREAM franchise and DON’T BE AFRAID OF THE DARK. Beltrami’s musical palette has since expanded to virtually all film genres.Beltrami has received two Academy Award nominations for Best Score. First, for 3:10 TO YUMA, starring Russell Crowe and Christian Bale, and shortly after for his score to the Academy award winning film for Best Picture, THE HURT LOCKER. Beltrami received a Golden Satellite Award in 2011 for Best Film Score of The Year for SOUL SURFER. His recent projects include SNOWPIERCER, THE NOVEMBER MAN, THE GIVER, THE WOLVERINE, TROUBLE WITH THE CURVE, THE SESSIONS, A GOOD DAY TO DIE HARD, and WARM BODIES. Beltrami has lent his musical voice to such unique hit films AS LIVE FREE OR DIE HARD, TERMINATOR 3: RISE OF THE MACHINES, and I, ROBOT. Other scoring credits include THE WOMAN IN BLACK, THE THING, and DEADFALL. Most recently, Beltrami created the nail-biting score to WORLD WAR Z and the AMC spy thriller TURN. THE HOMESMAN marks the third collaboration between Beltrami and Jones, who have also worked together on SUNSET LIMITED and THE THREE BURIALS OF MELQUIADES ESTRADA. When three women living on the edge of the American frontier are driven mad by harsh pioneer life, the task of saving them falls to the pious, independent-minded Mary Bee Cuddy (Hilary Swank). Transporting the women by covered wagon to Iowa, she soon realizes just how daunting the journey will be, and employs a low-life drifter, George Briggs (Tommy Lee Jones), to join her. The unlikely pair and the three women (Grace Gummer, Miranda Otto, Sonja Richter) head east, where a waiting minister and his wife (Meryl Streep) have offered to take the women in. But the group first must traverse the harsh Nebraska Territories marked by stark beauty, psychological peril and constant threat.